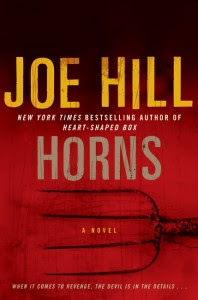 Joe Hill's second novel, Horns, is about a young man who wakes up one day to find two horns growing out of his head. When he begins to search for an explanation, he discovers that people, even complete strangers, are confessing their deepest, darkest desires to him and asking his permission to follow through with them. This was Hill's second novel and, in my opinion, the better one. The plot is unique. The main character is likeable and, at times, relatable. A down-on-his-luck kind of guy. We've all had those days (ahem, weeks, years). The writing is clever, and the book was edited to perfection. I feel like it's so rare nowadays to read a book that if you had the opportunity to remove a word or sentence or paragraph from it you wouldn't. I have to say, Horns wasn't one of those books I couldn't put down (maybe I should surrender to the call of The Hunger Games along with the rest of the planet) but one I was quite happy to pick up when my schedule allowed. Years ago, I remember reading the New York Times article announcing Joe Hill's "coming out" so to speak as Stephen King's son. I was thrilled. I'm a huge, HUGE fan of Stephen King and I was very keen to read his son's work, especially if a talent for the frightful written word had been passed down. Heart-Shaped Box was a disappointment, but I've been tempted to go back and reread it. Maybe I was in the wrong frame of mind at the time? Maybe I was unfairly expecting another Shining? One thing Hill has inherited from his father is his tendency to mangle animals in his books. Don't expect any furry creatures to make it safely to the end of Hill's novels. They die, and Joe, like Stephen, shows no mercy. Nearing the end of the book, Hill writes, "With its towering smokestack, it looked like a factory built to produce nightmares in mass quantities." Sounds like a famous, bifocal-wearing horror writer we know (minus the smokestack, of course). Time will tell if his son will be pumping out the same stuff of nightmares. But with Horns, Joe Hill is certainly on his way.